You can only edit banners that are “In development”. To edit banner that is approved by moderator and started, stop it first. If a banner was rejected by the moderator, you can edit it and re-send it to moderation. It's easier to edit a banner than to add a new one: all you need to do is adjust the parameters that caused it to be rejected. For example, if a .gif file was accepted, but a .swf file was not, then it's sufficient to attach a new .swf file. 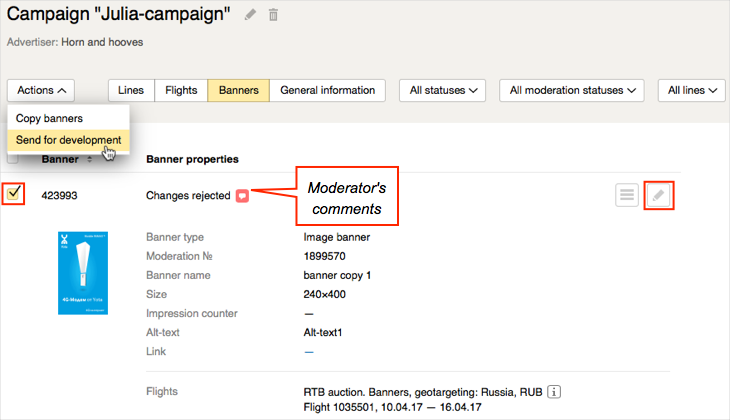 A history of reasons why your banners were rejected is saved when you make edits; this speeds up the re-moderation process. Click the button to find out why the banner was rejected. On the ad campaign page, go to the Banners tab, check the box next to the banner, and click Actions → Send for development. The banner status will change to “In development”. Click the button to edit the banner. Enter your changes and click Save. Send the banner for moderation. Just clickActions → Send to moderation.